Meteorites are fascinating no matter what direction you approach the topic. Whether it is as a meteorite hunter or collector or serious scientist there is a meteorite book that will help you to learn more or let you enjoy stories written by others some of whom are now celebrities. Even in a fast paced digital world there is still nothing quite like sitting down with a great book for a relaxing read. We have a selection of some of the newest books on meteorite related topics and some of the classics from years past. Don’t get caught on a winter evening with a fire and some cocoa but nothing good to read. 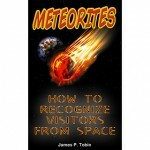 Meteorites - How To Recognize Visitors From Space New eBook If you have ever thought you would like to hunt for a meteorite or if you are a collector with some unclassified meteorites you would like to know more about, this book will help. Packed with photos and practical information it makes meteorite recognition easier for the hunter, and can assist the collector with some of his unclassified meteorite treasures. Even the seasoned collector and veteran hunter will enjoy the stories and close up photography.